the enlarged hop boxes were victorious within a day, major victories for the native laborers. bonuses, reimbursed transportation costs, beer fests at the end of harvest, and clean living spaces. t-weight: 400;">Before the logging boom hit the Evergreen State, the emerald forests of Washington spanned from the Cascade Mountains to the western coastline. By 1848, the California Gold Rush sparked a great demand for much-needed building material as seekers of fortune fled to cities like San Francisco in droves. Puget Sound sawmills hurried to take advantage of this demand. Even as the rush for gold waned in the decades to follow, the logging industry continued to grow. By the early 1900s, there were nearly 8,000 lumber workers in just King County. Not only did Washington produce the most lumber in the country, but the logging industry also employed the highest number of wage earners in the state. The demand for lumber dramatically changed the landscape of Washington. The need for the preservation of forest lands was recognized, but the cry for action was largely ignored because of their commercial value. The work done by the lumber workers was not only demanding, but it was also extremely dangerous and unsafe. Workers dodged massive falling trees and hoped to not lose a finger, a limb, or their lives in the woods and sawmills. Tree cutters, who were known as “fallers”, worked in pairs to saw the trees down by hands with cross-cut saws that earned the fitting nickname of “misery whips”. As the industry expanded, workers united to form unions that fought for better wages and working conditions. A victory was won in 1886 when numerous strikes that were led by the national organization, the Knights of Labor successfully reduced the workday to ten hours. Another breakthrough was made in 1911 when the Washington State legislature approved a bill that was drafted by the Washington State Federation of Labor and timber executives. This bill created the nation’s first workers’ compensation law. The logging industry continued to see the expansion of labor unions in the early twentieth-century. The arrival of the Industrial Workers of the World (IWW) in 1907 to the Pacific Northwest brought radical ideas and penetrating labor activism. In 1935, the Northwest Council of Sawmill and Timber Workers was formed and strikes ensued as members fought to receive union recognition and better wages during the Depression. Between 1935 and 1939, the hourly wage for sawmill workers increased by 20%. Workers uniting for a shared cause not only can lead to better wages and work conditions, but a common identity and an undivided sense of purpose for all workers. Center for the Study of the Pacific Northwest. “II. Seeing the Forest for the Trees: Placing Washington’s Forests in Historical Context.” University of Washington. Daniel DeMay. “Photos: A Tale of the Northwest’s Logging Past.” Seattle-PI. Seattle Municipal Archives. “Brief History of Seattle.” City of Seattle. Strikes! : Labor History Encyclopedia for the Pacific Northwest. “Timber Strike of 1935.” University of Washington. The early founders and leaders of the Knights of Labor envisioned a future where workers can come together in solidarity and identify themselves as wage-earners first, regardless if they are black, white, skilled, unskilled, men, or women laborers. The organization’s motto was, “An injury to one is the concern of all.” The members of the Knights of Labor were simply seeking an eight-hour workday, elimination of child labor, and equal pay for equal work. At their peak in 1886, the Knights of Labor boasted over 700,000 members. In 1870s and 1880s, the Knights of Labor held winning strikes against the railroad industries. In the Great Railway Strike of 1877, thousands of members banded together to halt the Union Pacific Railway. Members didn’t merely walk away from their job, but they “killed” the trains’ fire engine by drenching them in water and destroying railways. When the talk of another railroad strike began to brew in 1884, railway corporations proceeded to settle grievances by arbitration and collective bargaining with Knights of Labor leaders. The news of their victories made their way across the country. Despite their progressive and inclusive goals, the Knights of Labor had their faults practiced exclusion. Fearing that their jobs would be given to Chinese laborers who were willing to work for lower wages, the Knights of Labor aggressively campaigned and took actions in 1886 that ultimately expelled hundreds of Chinese workers on the West Coast, including Seattle and Tacoma. Membership in the Knights of Labor began to decline this same year due to the increasing number of violent strikes, protests, and deaths that arose. After the Civil War, black laborers were often dismissed to make room for white laborers and if they were kept on the job, their pay was often a lot less. The Colored National Labor Union was founded on the hope that not only would black workers be able to form their own unions, but to eventually affiliate and integrate into white unions. Founder, Isaac Myers, operated under the belief that unions could only strengthen if all workers unified to fight for the same cause regardless of their skin color. The Colored National Labor Union and other black unions began to protest and demonstrate in order to improve wages and work conditions. These protests, along with strikes, proved to be successful in numerous occurrences. In 1882, black workers learned that the Knights of Labor were actively recruiting black members. By 1886, black membership in the Knights of Labor reached 60,000. Any increase in membership only helped all unions to grow stronger in solidarity and gain more financial power to pursue their causes for workplace improvement. Britannica. 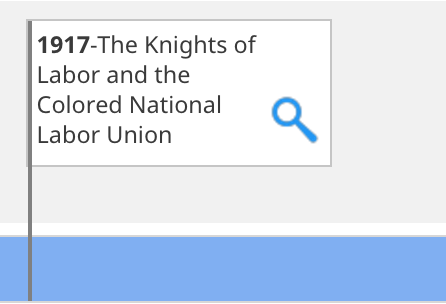 “Knights of Labor (KOL).” Britannica. Encyclopedia.com. “Colored National Labor Union.” Encyclopedia.com. al passenger train No. 25 and Fast Mail train No. 27 sat waiting in the town of Wellington for the storm to end or the tunnel to be cleared. Workers shoveled hard to open the passage using rotary plows but they were ineffective against the blizzard. Moreover after a recent wage dispute many of the mountain division’s shovlers had been fired, the temporary replacement workers soon began to quit under the grueling and never-ending work. After days of waiting the storm out the weather suddenly shifted, warmer weather and rain moved in creating a deadly formula. At about 1:42 am a slab of snow 10 feet high and a quarter mile wide broke off and slid down directly into the waiting trains. Many were crushed instantly, other were trapped underneath metal and snow. Eventually 23 survivors were pulled from the rubble, freed from their buried compartments. The majority were killed with the count at 96 though it took months to find all the bodies. Newspapers reported on the horrific event, focusing more on the train’s 35 passengers, businessmen, lawyers, women and children, though two-thirds of the deaths were railway clerks, trainmen and laborers. Known for its harsh working environment many of the workers had been young rookies. The avalanche decimated an entire community of young workers in the railroad town of Wellington. The Great Northern Railway attempted to address the danger of avalanches in the area by later constructing concrete snow-sheds over the tracks but the tunnel’s bloody legacy could not be forgotten. They eventually abandoned the tunnel and build another one lower down on the mountain. pegoat for job shortages. Cultural misunderstandings, language barriers and segregation furthered enhanced the growing hatred. Daniel Cronin organizer of the Knights of Labor Seattle chapter used anti-Chinese sentiment to increase membership and worked to radicalize the disgruntled workers in Seattle. In 1885 he formed the Anti-Chinese Congress was created, declaring that all Chinese must leave western Washington by November. In Seattle the Committee of 15 was formed to deal with the Chinese but the group was divided between a legal approach and a more immediate approach, the later supported by labor unions. In February with tensions growing stronger the group met at the Bijou Theater in Pioneer Square and decided that the Cubic Air Ordinance was the legal doorway they needed to push the Chinese out. The ordinance required that there were 512 cubic feet of air space per person and Chinatown’s crowded homes were deemed in violation. The next morning, along with some police force they began inspecting homes and forcibly removing people. The Chinese found themselves and their belonging being escorted right to the dock to be put aboard the Queen of the Pacific, a boat headed to San Francisco. Capitan Jack Alexander refused to board the passengers without their fares being paid but the momentum of the mob would not be stopped. The crowd, eager to finish their mission, began donating the money to be rid of the Chinese and soon had almost 200 on board. Chief Justice Roger Green hearing about the attempted expulsion and coercion issued a writ of habeas corpus, ordering the Captain to appear for illegally restraining the Chinese. The following morning, after spending the night at the docks, the judge questioned the Chinese but most confirmed their choice to leave. The Queen was filled up and set sail but many were left on the dock waiting for another ship. The guard decided to take them back to their somewhat destroyed houses to wait but when word got out, chaos ensued. The guards leading them back to Chinatown only got half way when an angry mob of 2,000 men including many members of the Knights of Labor, confronted them. Sheriff McGraw along with the Seattle rifles and military unit company D all assembled to protect the Chinese. As soon as gunshots rang out the Chinese threw themselves onto the ground and the guards formed a square of protection around them. They lay face down on the street for 45 minutes until the agitators decided to lay down their arms. Five men had been injured and one, Charles Stewart died the following day. Most of the remaining Chinese fled in the following days, leaving less than 50 in the city. The horrific incident prompted the Governor to declare martial law and President Grover Cleveland ordered additional troops to Seattle who remained there for several months. A lengthy trial was held but within 10 minutes of deliberations the jury found all innocent. It took almost 20 years for the Chinese population in Seattle to rebuild to their former numbers. 10 to 11 working hours that was considered the norm. The workers went on strike and the company refused to negotiate with their employees. The coal company’s solution to continue with production was recruiting black workers from the Southern states to Roslyn. Unbeknownst to the 50 black workers who first arrived, they were recruited to be strikebreakers and to replace the striking white miners. By 1889, there were 300 black miners who made their way to Roslyn with their family in tow. In another short decade, Roslyn would become home to one of the highest population of African Americans in Washington. Roslyn was a culturally vibrant community in the early part of the twentieth-century. However, in those early days, the stand-off between white and black workers were extremely tense in these early years of arrival. But as the demand for coal grew, so did the need for more labor. White workers conceded their request, returned to the mines, and peacefully worked alongside their fellow black peers. When the United Mine Workers of America organized the miners, black and white workers joined as equals. It is sad that a momentous event like this one is overshadowed by a massive explosion that claimed the lives of 45 workers in 1892. Despite this horrific tragedy, the coal mines in Roslyn proved that unionizing and banding together regardless of race yielded the best results for all workers. Trevor Goodloe. “Roslyn, Washington.” BlackPast.org. Jim Kershner. Roslyn Coalminers Strike, Precipitating the Importation of Black Miners, on August 17, 1888.” HistoryLink.org. David Wilma. Worst Coalmine Disaster in Washington History Kills 45 Miners at Roslyn on May 10, 1892.” HistoryLink.org. >The several smaller strikes that occurred in the years leading up to 1934 were not as impeccably organized and as effective, but they did usher in some groundbreaking policies within the union. By 1915, the International Longshoremen’s Association (ILA) represented longshoremen in all major West Coast ports of the country, including the ports of Seattle and Tacoma. When the first longshore workers strike reared its head in 1916, hundreds of black laborers were hired to break the strike and fill the worker void. When the strike was over, black workers were granted membership into the Seattle local ILA, making it the first Pacific local to do so. At this time, the Seattle ILA also implemented a “list system” to protect black workers and to ensure that jobs were distributed fairly to all workers. After the victory of 1934, black and white workers celebrated together. Black longshoremen also began to find themselves in positions of leadership within the union itself and many would go on to advocate for civil rights. The Great Strike of 1834 was fueled by the desire for the ILA to have control of the port hiring and dispatching of workers. The option to do these leads to the control over working conditions at the ports and waterfront. In Seattle alone, 2000 ILA union members took part in the Great Strike. Local organizers recognized that more effective planning and action could take place if local leaders were present. Members of the union could then have direct access to leaders and hold them accountable for any actions or lack of. The Pacific Northwest locals also implemented a voting system that allowed for all members to have a voice in making major decisions. This process was groundbreaking. Nearby ILA locals also united in solidarity to achieve greater goals. Picket lines achieved results, violent and deadly incidents were lessened, and single ports could be easily closed with the greater number of members involved. The Great Strike came to an end in July 1934 when President Franklin Roosevelt intervened. The victory of the Great Strike redistributed power in favor of organized labor and eliminated discrimination union longshoremen faced in the past. After the strike, the ILA aligned themselves with the new Congress of Industrial Organizations (CIO) and became the International Longshore and Warehouse Union (ILWU). We all win when workers unite to fight for a greater cause, they can change the present and the future of labor! Rod Palmquist. “Labor’s Great War on the Seattle Waterfront: Part 3 – War on the Docks.” University of Washington. Michael Reagan. “Maritime Workers and Their Unions.” University of Washington. The shipbuilders and their unions played a significant role in making Seattle an international port city. Like the logging industry, shipbuilding helped in expanding Seattle’s economy and population. In the late 1890s, Seattle became one of the nation’s leading locations for shipbuilding. Construction began on fleets of steamboats to fill the needs of thousands of men and women as they made their way from Seattle to Alaska and back for the Klondike gold rush. In 1919, the shipbuilders of Seattle came to national attention when laborers went on strike at the shipyards to maintain their wages during World War I. This event played a pivotal role in the lead up to the larger Seattle General Strike of 1919 that united all 110 Seattle labor unions. Lasting five days, the Seattle General Strike is the longest of its kind in American history. The labor unions in Washington state were vocal antiwar activists and called for peace. However, during World War I, the shipbuilders in Seattle produced 20 percent of the country’s wartime ships. The mural artists chose to depict Seattle’s shipbuilding industry through traditional Native American techniques. By showing two men who work jointly and face each other, the artists are presenting a peaceful boatbuilding image that shows balance and collaboration. Burke Museum. “Restoring Through Rebuilding.” Burke Museum. lumber and shipbuilding industry was seen in the 1920s. The stock market crash in October 1929 was felt across the nation and the Pacific Northwest sank into a depression that lasted nearly a decade. In 1931, out of work and home, unemployed men started building shacks on land that had been vacated by the Port of Seattle. These dwellings were made from packing boxes, particle board, remnants of steel, and any other discarded materials that could be found. Needless to say, amenities were lacking and sanitation was nonexistent. The shantytowns came to be called “Hooverville”, named in sarcastic honor for the U.S. president of the time, Herbert Hoover. Despite being burnt down several times by the Seattle Health Department, the unemployed men did not relent and rebuilt their shack towns. Seattle’s shantytowns were flooded with thousands of displaced laborers and frustrated immigrants. A violent, criminal, dirty, and drunken portrayal of these men soon emerged. Some residents of Seattle had a xenophobic and communist fear of the multiethnic group of homeless men and police raids were common. Some even had their citizenship status investigated. Blacks and Russians were met with equally skeptic eyes. These men built what was to become the landmark of the Great Depression in Washington State. In an effort to erase this negative image and to further educate themselves, a proposal to create Hooverville College in Seattle was developed. There were 2000 men who were willing to organize and participate on “Social science, social psychology, government, legislation labor movements, economics and economic history, community history, current industrial problems, international affairs, history, and English.” The courses were designed to give these men insight into new labor movements, immigration policies, and economic distresses that were appearing in the 1930s. Unfortunately and unexplainably, the college never came to fruition even though courses were planned, teachers were found, and federal grants were obtained. Even in the worst of economic times, workers gathered together to provide camaraderie to each and cohesive efforts were still made to improve the lives of workers. Greg Lange. “Hooverville: Shantytown of Seattle’s Great Depression.” HistoryLink.org. Seattle Municipal Archives. “Hoovervilles in Seattle.” City of Seattle. Joey Smith. “A Tarpaper Carthage: Interpreting Hooverville.” University of Washington. Water Company, whose small wooden pipes and low water pressure failed the city in its hour of need. As the fire spread the Mayor ordered the block to be blown up to contain it but the fire jumped across. The city’s courthouse and records were saved as bystanders who thought to pour water down the roof and sides of the building. Henry Yesler saved his house by covering it in wet blankets. Few other buildings survived. As it became clear the city could not be saved many fled by wagon and by ship. The 120 acres and 25 blocks burned till 3am with smoke visible from Tacoma. The next morning the city didn’t waste a moment mourning for the massive loss of their town. Instead business owners gathered to create a plan, a relief committee was instituted to manage charitable donations from around the country, several hundred special deputies were sworn in to prevent looting and martial law was declared. The armory was converted into a dining hall to feed the misplaced and hard-working citizens. The fire had destroyed over 5,000 jobs but rebuilding the entire city led to a boom in construction jobs involving the new zoning codes favoring brick and stone over wood. The city also addressed the inadequacies of the city services that arose during the fire, creating a professional fire department and taking control of the water supply. Seattle got an unexpected fresh start with the great fire as it destroyed many vermin infested and outdated buildings. �s Protective Union (CRFPU) was formed in 1880 and they were successful in their exclusion and also gained small increases for sale price of the fish that was caught. The CRFPU expanded and later joined the newly formed American Federation of Labor (AFL) in 1886. While unions continued their fight with the fishing and canning companies, they were also complicit in excluding Alaska Natives from work in the industry. Fishing and cannery work was cold, wet, dirty, dangerous, and came with very low wages. Cannery work was so undesirable that only immigrant workers were willing to do the job. In the 1880s and 1890s, the labor force was primarily filled by Chinese workers who had the undesirable job of cutting and gutting fish. When a machine came along to mechanize this part of the fish-cleaning process, it was called the slur-inspired name of the “Iron Chink.” As anti-Chinese sentiment spread across the nation and the Chinese Exclusion Act of 1882 was enacted, the industry needed to find other minority groups who were willing to do these unwanted jobs. Japanese workers filled this void for a short period before the nation endorsed another Asian exclusion act in 1924. After the 1920s, Filipino workers came to dominate the canneries. The first attempts to unionize the canning industry were led by Filipino workers and the Cannery Worker’s and Farm Laborer’s Union was launched in 1933 when they received their charter from the AFL. Crystal Fresco. “Cannery Workers’ and Farm Laborers’ Union 1933-39: Their Strength in Unity.” University of Washington. Waterfront Workers History Project. “Cannery Workers and Their Unions.” University of Washington. Waterfront Workers History Project. “Fishing Workers and Their Unions.” University of Washington. The business leaders in Everett, fearful of the IWW’s revolutionary rhetoric, had the sheriff and some 200 “deputized” and armed men confront the union men at the docks. Undeterred by the hundreds of guns pointed at them, they prepared to disembark. “Who is your leader,” shouted Sheriff Donald McRae. “We are all leaders here.” Came the reply. McRae pulled his gun. The gangplank was almost in place. “You can’t land here!” McRae shouted. A shot rang out from somewhere. Then another. Then the battle was on and all chaos erupted. After the shooting stopped, five men from the IWW lay dead as did two deputies. Many more were wounded. Once the members of the IWW returned to Seattle they were arrested and charged with murder, but no one was convicted and eventually all charges were dropped. Mayworks 2016, the workers’ cultural and historical celebration sponsored by the Washington State Labor Council, will remember these courageous workers and their struggles on this 100th year anniversary. Join us in the many events planned for the month of May and later this year on November 12th when we sail from Seattle to Everett on a restored steamer similar to the Verona to commemorate the Everett Massacre. ry work was cold, wet, dirty, dangerous, and came with very low wages. It was so undesirable that only immigrant workers were willing to do the job. In the 1880s and 1890s, the labor force was primarily filled by Chinese workers who had the undesirable job of cutting and gutting fish. When a machine came along to mechanize this part of the fish-cleaning process, it was called the slur-inspired name of the “Iron Chink.” Working extended long hours only added to the already hazardous work conditions because workers were in danger of falling asleep with their fingers close to the cutting blades of the machine. As anti-Chinese sentiment spread across the nation and the Chinese Exclusion Act of 1882 was enacted, the industry needed to find other minority groups who were willing to do these unwanted jobs. Japanese workers filled this void for a short period before the nation endorsed another Asian exclusion act in 1924. After the 1920s, Filipino workers came to dominate cannery jobs. The first attempts to unionize the canning industry were led by Filipino workers and the Cannery Workers and Farm Laborer’s Union (CWFLU) was launched in 1933 when they received their charter from the American Federation of Labor (AFL). The mural artists foreshadow this historic event with a framed photo of the future founders of the union that can be seen behind the cannery workers. The CWFLU was based in Seattle and was organized by “Alaskeros” who worked in the Alaska salmon canneries in the summer and harvested the fields of Washington, Oregon, and California during the other seasons. By 1936, membership had risen to 2000 workers and the union was systematically gaining better wages, overtime pay, shorter working hours, and adequate meals and housing. It was the shared goals and fraternity that helped these Filipino men eliminate the mistreatment of cannery workers and to carve out a better life for themselves and their community. big test. The strike began with the Metal Trades Council Union Alliance and their appeal to Seattle’s most powerful union, the Central Labor Council. Union members were polled and 110 unions decided to join the strike in support, with a sympathy walkout. The solidarity amongst the workers was evident by even the segregated Japanese American Unions joining the strike, posting signs on their restaurants contradicting their “we never close” signs with ones that read “we believe in labor’s cause, so we have closed.” The city went silent for 5 days with 88 public schools voluntarily shutting down and churches rallying in support. A General Strike Committee was created to guarantee that the strike was not harmful to the citizens of Seattle, ensuring basic necessities like heat, light, food and safety were not denied to any citizen. Kitchens were set up to provide affordable food for strikers and those needy in the city. Despite the strike being completely non-violent and well organized with workers continuing to provide clean linens for hospitals, food for invalids and babies and a veteran guard to prevent disorder, the media decided to paint the event in the extreme. Newspapers urged strikers to end the general strike, claiming it was “a dangerous weapon” that had never been used before. Across the country the strike was portrayed as an un-American Bolshevik revolution. One of the few exceptions was the Union Record, a labor owned newspaper whose editor, Anna Louise Strong, played a vital role in advocating for and supporting the strike. However, along with the IWW and Socialist Party Headquarters, the paper was shut down, and members arrested. Mayor Old Hanson began to call in additional police, federal troop, sailors, and marines building up a force and threatening to replace the striking workers, promising a show of force to come. Workers began to slowly return to work under these additional threats. International union pressure, along with the difficulty for workers living in a shutdown city, pushed for the end of the strike. Though the revolutionary framing of the event prevented it from being praised as the unique, collective, and non-violent movement that it was, it empowered workers to understand how they could come together and unite for their collective rights. Rival unions put aside differences, skilled and unskilled workers unified, female and male were all distinctions forgotten for this historic general strike. employment agencies encouraged the city council to pass an ordinance forbidding speaking on the streets. Initially, with many workers gone for summer harvest jobs, the Wobblies respected the ordinance. However when the city decided to make an exception for the Salvation Army and other religious groups, the I.W.W decided it was time to fight for their right of free speech. In November the offensive began with a call to all workers to “Come fill the jail in Spokane.” A mass protest of civil disobedience began with workers mounting soap boxes across the city to publically speak. They were pulled off and jailed almost immediately with over 100 arrests the first day. The Wobblies recited everything and anything just to make a point including the Declaration of Independence. They were a group of German, Swedish, Italian, and Irish workers. The Salvation Army would preach and sing to the Wobblies but they would just chant to the tune of their songs. By the end of the month the number was up to 500 arrests with the Industrial Worker reporting on the prison hunger strikes, accounts of police brutality, jail conditions and that the jail was being used as a brothel. The police immediately arrested 8 editors, attempted to destroy all copies of the print and the paper moved to Seattle in order to maintain publication. Nineteen year old pregnant and well-known socialist Elizabeth Gurley Flynn joined the fight and helped turn public sentiment in favor of the Wobblies and their fight for free speech. With growing national attention and prisoner costs, the city came to an agreement with the Wobblies to release them and re-open the paper if they didn’t pursue any lawsuits. Though it seemed at first that the city had won the fight they soon after revoked the ordinance and the licenses of the employment agencies that had started all the trouble. lected onto the Seattle School Board. She was favored strongly for this position due to her expertise in child welfare and labor movement. During her short tenure on the school board in 1916, Strong argued for the need of social services for the underprivileged children of Seattle. Strong was profoundly affected by the events of the Everett Massacre that took place on November 5, 1916. She was hired by the New York Evening Post to report the deadly details and it was what she observed first-hand that led her to become the fervent and radical voice the working class of Seattle came to know. She contributed many columns and editorials to the labor-owned daily, the Seattle Union Record, and her strong published opinions caused her position on the Seattle School Board to be revoked. As the figure that may seem to be appropriately cloaked in red, Strong was branded a dangerous and revolutionary Communist. She was arrested on the charges of plotting to incite resistance against the United States government. The charges were eventually dropped, but Strong did not lessen her pleas to the working public to unite and take a stand for workers’ rights. She did not hesitate to let her words fall out. …BUT, the closing down of the capitalistically controlled industries of Seattle, while the WORKERS ORGANIZE to feed the people, to care for the babies and the sick, to preserve order—THIS will move them, for this looks too much like the taking over of POWER by the workers. Although it may have appeared like the entire city shut down, the 60,000 workers of Seattle’s 110 local unions joined together in solidarity to organize a system that kept essential services open. One voice can make a difference! Communism in Washington State: History and Memory. Witness to Revolution: The Story of Anna Louis Strong. University of Washington. Rebecca B. Jackson. “The Politics of Gender in the Writings of Anna Louise Strong.” University of Washington. Strike: Seattle General Strike Project. “The Seattle General Strike.” University of Washington. What the woman who labors wants is the right to live, not simply exist — the right to life as the rich woman has the right to life, and the sun and music and art. You have nothing that the humblest worker has not a right to have also. The worker must have bread, but she must have roses, too. One of the first steps women took towards achieving this balance in life was the labor movement for a shorter workday. In 1909, activists found support with Congressman John Campbell. Supporters of the new measure for the shorter work-day were found across the state in places like women’s clubs, churches, and other religious organizations. Women marched arm-in-arm for this cause and a petition campaign was launched and it was reported that the list of supporters’ names stretched “three city blocks long.” Strong lobbyists and activists triumphed and on March 2, 1911, the bill passed the state senate. It is thought that women’s activism and outcome like this that made passage of the minimum wage law possible in August 1915. When workers unite, we all win! Mildred Andrews. “Alice Lord Sparks Seattle Waitresses to Organize on March 23, 1900.” HistoryLink.org. Margaret Riddle. “Washington State Senate Approves An Eight-Hour Workday for Women on March 2, 1911.” HistoryLink.org. Washington State Historical Society. “The Eight Hour Day.” Washington State Historical Society. e. In the 1884 election, women voters outnumbered the men. The votes women casted during the early years of this newfound right helped to eliminate corrupt politicians in office. However, the right to vote was short-lived and in 1887 it was revoked by the Washington Territorial Supreme Court. Those in support of women’s right to vote did not stop their fight to regain this privilege. Women’s suffrage and voting leagues were organized. They picketed, marched arm-in- arm, protested, lobbied, lectured, and held conventions gathered thousands of supporters until their cry was finally heard. In November 1910, a majority of male voters ratified the woman suffrage amendment. Every county in Washington voted in favor of the amendment with support coming from all political parties and across all demographics. Washington became the fifth state in the union to pass women’s suffrage and they did not hesitate to enter their votes into the ballot box. This win was achieved a decade before the 19th Amendment enacted the same right for all American women in the United States on August 18,1920. In this decade, Washington women remained involved in the national crusade for women’s suffrage and the state’s victory encouraged the other Western states to follow suit. No matter how long the fight is, unity triumphs! America’s Historical Documents. “19th Amendment to the U.S. Constitution: Women’s Right to Vote.” National Archives. Mildred Andrews. “Women Suffrage Crusade, 1848-1920.” HistoryLink.org. A Ballot for the Ladies. “Washington Women’s Struggle for the Vote (1850-1910). University of Washington. 0;"> 1919, during the Armistice Day Parade, Wobblies knew an attack was eminent and on the advice of their lawyer, Elmer Smith, had armed themselves to lawfully defend their property. The American Legion veterans halted by the hall during the parade but were taken by surprise when an armed mob met them as they stormed the hall. No one knew who fired first but two veterans were shot and killed by Wesley Everest and Ray Becker. Veteran Dale Hubbard chased after Everest and cornered him on the bridge and ordered him to surrender. Instead Everest shot him but was apprehended by a group of veterans and citizens who attempted to lynch him. It was prevented in time and he and other I.W.W members were placed in jail. Amidst the chaos that night someone pulled the switch at the power distributer, cutting the lights for the whole town. Townsmen and veterans broke into the jail to remove Everest, who was thought to be Britt Smith, an I.W.W leader. He was then lynched over the Chehalis River, mutilated and shot. The mob didn’t know his real identity and that he was the man responsible for the death of two of the veterans. The city’s undertakers refused to deal with his dead body so it was taken to jail and dropped off with the other prisoners as a warning. The prisoners had to build a coffin and bury him. The next day vigilante mobs swept through the surrounding area searching for more I.W.W members. Instead they came across each other and mistaking the other for Wobblies fired upon the other, leading to the death of another townsman. The National Guard was called in and Wobblies were arrested across the state and soon across the country as well. It then became illegal to be a member of I.W.W in Washington State. Tensions remained high for years including a lengthy trial for ten I.W.W members charged with conspiracy to commit murder. The trial was fraught with claims of jury intimidation, judge bias and injustice. Eventually eight of the ten were charged with second degree murder, with one claiming insanity. Though the jury urged leniency the Judge went for the full 25-40 year sentence. Attempts for sentence reductions and retrials due to jury members recanting their verdict went on for years but were largely ignored. By 1933 memories of the event had died down and activist’s constant fight for the imprisoned finally led to the parole of the remaining jailed members, one had died in prison. The one exception was Ray Becker who refused, wanting to be released when the governor would admit wrongdoing in relation to their trial and imprisonment. Three years later his sentence got commuted by the governor for time served. Public sentiment had grown increasingly sympathetic to the imprisoned for their harsh sentence, and was gratified by their parole and the conclusion to the events that were later named the Centralia Massacre. In the mural two farmworkers, one carrying an empty bucket from working in Yamina Valley, and the other carrying water, stand back to back, amidst a road shaped like a figure eight. They were under attack for stepping out for fair 8 hr workday, as well as being isolated from society at large while working as migratory workers. Behind them, is a smaller scene of the stockade hall that was built to imprison protesting workers, and a depiction of the attack, as one worker tried to walk off the field in protest organized and supported by IWW. canceled in 1943. The work relief program was more expensive than direct relief payments, but worth the added cost, Hopkins believed. “Give a man a dole,” he observed, “and you save his body and destroy his spirit. Give him a job and you save both body and spirit”. being irrigation and flood control. While hydropower is the primary purpose of the dam today, the public desire for irrigation was the driving force behind its construction. e RLA and the NMB allows for all parties to have a voice. The RLA puts equal responsibilities upon the unions and the employers. It requires that employees put forth every reasonable effort to make and maintain collective bargaining agreements. The RLA is administered by the National Mediation Board (NMB) and they assist both parties so that quick and peaceful solutions are the result. In the end, the tracks of labor can continue like the thousands of miles of rail tracks workers have laid in the United States! Federal Railroad Administration. “Highlights of the Railway Act.” U.S. Department of Transportation. The BSCP faced long odds in 1925. Despite its charismatic leadership, the union attracted only a small number of rank and file workers and at no point before 1937 did it enroll a majority of porters. Most black leaders outside the organization distrusted labor unions and, moreover, viewed George Pullman, whose company provided jobs, relatively high incomes, and a modicum of services to black employees, as an important ally of the black community, a reputation Pullman assiduously exploited in his effort to undermine the nascent union. Meanwhile, while the AFL granted federal-local status to individual BSCP locals, it refused to charter the all-black union as a full-fledged international. money for the NAACP kicking off an era of musical culture. Though Jackson Street became known as ‘poor man’s playground,’ its jazz clubs and illegal bars during prohibition soon had the whole city on its doorstep. The jazz bands were mostly African American but as for the patrons of the Dumas Club, Black and Tan or the Blue Rose, race and class were put aside. Though all were welcome on Jackson Stree, black musicians were not welcomed in clubs downtown north of Yesler. Many outraged white musicians left their union, Local 76, in protest and joined the African American musicians union, Local 483. The underground clubs kept the party going during prohibition and raised morale during the depression with police looking the other way for small pay outs. Even the occasional raids had the opposite effect, bringing more sympathy and patronage to the clubs. Seattle’s well known all-hours music scene drew in young Ray Charles and Quincy Jones in the 1940s looking for their big break. Charles’s first gig was on Jackson Street at the Black Elks Club. mericans remained strong in spirit and community. On February 19, 1942, President Roosevelt signed Executive Order 9066, authorizing the forced evacuation of 117,000 persons of Japanese ancestry. Two-thirds of those removed from their homes were American citizens. In Washington state, over 14,000 Japanese and Japanese Americans packed up what they could each carry and could only hope they have a home and belongings to return to. Abandoned homes and storefronts began to make their presence known amongst the citizens who were not evicted. Some were fortunate enough to leave their entire livelihood to the hands and protection of trusted friends. The Murakami family who owned and operated the Higo Variety Store on Seattle’s Jackson Street were fortunate to have friends that looked over their business and ensured it was still standing when the they returned. But many did not have this luxury and returned home to virtually nothing. Homes, businesses, and possessions that they worked so hard for were all gone. Some did not even bother to return home, knowing that there was nothing there left for them. Incarcerated Japanese families were bused to “assembly centers” and eventually made their way onto trains that would take them to their final unknown destination. The internment camps were hastily built and many structures were left half-finished. For the next few years, the interned would live in small barracks and sleep on army cots. The internment camps also included a hospital, administration buildings, a warehouse, churches, and schools. The government may have taken their everyday life and freedom away, but the interned Japanese refused to let them take their spirit for living away. Despite being suddenly removed from the only life they knew, the Japanese overcame defeat and despair by building for themselves a vital community. Adults did their best to provide the children with a “normal” childhood. They went to school, played with their friends, and still had responsibilities and chores. Adults found “jobs” for themselves, engaged in making arts and crafts, created social clubs, and activities to pass the time away. When the U.S. military began to admit Japanese American men in January 1943, many jumped at the chance to come to the aid of the government; the very same government that was holding them hostage. The all Japanese American 442nd Regimental Combat Team served with distinction and for its size and length of service, it was the most decorated military unit of the war. The Japanese were finally allowed to return home January 1945. The detention of persons of Japanese ancestry during World War II sparked constitutional and political debates. When Executive Order 9066 was drafted, the stated objectives were to prevent espionage and to protect persons of Japanese descent from harm at the hands of Americans who had strong anti-Japanese attitudes. A Japanese internee poignantly asked, “If we were put there for our protection, why were the guns at the guard towers pointed inward, instead of outward?” upon hearing the latter objective. Shameful, shocking, and misguided events like this in history must be told to future generations. We all need to remember the past as we prepare to shape the future. Never again. Luke Colasurdo. “The Internment of Japanese Americans as reported by Seattle Area Weekly Newspapers.” University of Washington. Kathleen Kemezis. “Higo Variety Store (Seattle).” HistoryLink.org. National Archives. “Japanese Relocation During World War II.” National Archives. David Takami. “World War II Japanese American Internment – Seattle/King County.” HistoryLink.org. -weight: 400;">The short lived Public Works of Art Project (PWAP) ushered in the first major era of government patronage for the arts. Between 1933 and 1934, the PWAP employed 3,700 artists who created nearly 15,000 works of art. The program was launched with the intent to provide work to artists by having them enhance public buildings. In Washington state alone, more than 50 artists were commissioned and together they created over 400 murals, 6,800 paintings, 2,600 print designs, and 650 sculptures. For the everyday person, the artworks prompted cultural and social awareness as the viewer interpreted the themes of the working class in America. Following the dissolution of the PWAP in 1935, the Federal Art Project (FAP) under the guidance of the Works Progress Administration (WPA) was formed with the same goals in mind. In all, the WPA funded tens of thousands of artists who collectively created 2,566 murals and 17,744 pieces of sculpture that decorated public buildings nationwide. WPA supported works of art are found in Washington state as well. The WPA only requested that the subject matter of the artwork was the “American scene.” The depression era artists whole heartedly welcomed this idea and many concluded that the backbone of modern America was shaped by the story of the working class and labor. Paintings of cityscapes and industrial scenes were prolific, such as; shipyards, lumber mills, and coal mines. When Ellen Woodward became the director of the women’s programs at the WPA, she succeeded in pushing for women’s inclusion in the Professional Projects Division. By doing this, women were treated equal to men in the art, music, theater, and writers’ projects. These various WPA programs in the arts eventually led to the creation of the National Foundation for the Arts and the National Endowment for the Humanities. The arts are even more important today as cries for equality, civil rights, social justice, and peace are needed now more than ever. Artists and writers use their best medium to capture the attention of the masses and bring awareness to social causes. In this mural scene, two WPA muralists are painting a high view of the Seattle waterfront as seen from the hilltop of Jackson Street. The mural they are painting is a window into the future of the city. The two female painters working on the WPA mural is a reflection of Katherine Chilcote and Devon Hale, the two women artists who painted the Jackson Street Workers Mural. During this mural project with the Washington State Labor Council, AFL-CIO, Katherine and Devon became unionized artists. A prime example of using public art to bring awareness of the labor and civil rights events of the past, today, and the future. Jerry Adler. “The Art of the New Deal.” Smithsonian Magazine. The Art Story. “Federal Art Project of The Works Progress Administration.” The Art Story. John E. Hansan. “WPA: The Works Progress Administration.” Virginia Commonwealth University. Ellen Mahoney. “The Public Works of Art Project in Washington State.” University of Washington. WPA Murals. “History of the New Deal Art Projects.” WPA Murals. : 400;"> walking out. They were joined by other craft unions on contract with the paper including web pressman, mailers, stereotypes, photoengravers and typographers. The Seattle Times was forced to stop publication with the strike of almost 700 workers. The guild was demanding a 7.3% wage increase for the writers and editors who were paid, $102 and $110 a week respectively. In August the Times offered a 3.5% increase but the guild unanimously reject the offer. After three months of the strike the paper offered a little over a 6% raise and the strike came to an end with publication beginning again on October 19th. The Web Pressman Union also shorted their work week from 37 to 36 hours and got a $2.80 raise. Their success paved the way for workers in similar conflicts across the country. Just the following month in New York six out of their seven papers shut down due to strikes between November 28th and December 8th. Again the strike was initiated the unions, the AFL International Photoengravers Union representing 400 engravers demanding better working conditions and higher pay. Once they had their picket line up to 20,000 other workers, including printers and sterotypers, honored the strike making it truly effective. More than five million readers were affected by this strike and publishers caved after 11 days, with settlements costing them upward of three million dollars. In the golden age of print media workers were able to find their voice through strikes to improve their conditions. le. The effort to preserve fair and equal opportunity in the workforce was aggressively sought in this era, but reform is still needed even now. n 1896. Ironworkers soon came to be known as “cowboys of the sky.” Brave and daring men climbed never before reached heights to wrangle tons of iron and steel beams to meet the demand for stronger bridges and buildings. As these men became husbands and fathers, their families became a priority. By realizing that ironworkers are better together, they fought for better wages, job security, reasonable working hours, and safer conditions. By joining together, they sought for a way to provide for their family in health, sickness, or death. Not only were the ironworkers better together, they were stronger together. Over the years, ironworkers have worked on many memorable projects, such as; the Golden Gate Bridge, the Sears Tower, the St. Louis Arch, the World Trade Center, and now Freedom Tower. Whether fabricating the steel or building with the finished iron beams and materials, all these workers want the same labor rights. Workers may have a variety of jobs, but at the end of the day, they all want to go home with a fair day’s pay in their pockets and a job to go to the next day. No matter the type of job, all workers are stronger when they unite to fight for their rights! The International Association of Bridge, Structural, Ornamental and Reinforcing Iron Workers Union, AFL-CIO. “Who We Are – About the Union.” Ironworkers. United Steelworkers. “Our History.” United Steelworkers. The International Brotherhood of Electrical Workers was founded 1891 shortly after businesses and homes in the United States began to be wired for electricity. Much of the success of the industries that stimulated the growth of the nation depended on the work of those who worked in the dangerous trade of raising power poles and connecting power lines. Electrical workers acted collectedly to bring higher safety and living standards to their trade and developed apprenticeship programs that created workers with high skills. created workers with high skills. The Puget Sound’s electrical workers’ local has nearly as long of a history and was chartered in 1901 in Seattle. Today, IBEW Local 46 consists of over 5,000 members. In an effort to bring awareness to problems racial minorities and women workers face in the electrical industry, workers formed a chapter of the Electrical Workers Minority Caucus (EWMC). The primary goals of the EWMC are to promote equal opportunity and employment for minorities at all levels of the IBEW structure, provide education and training for its members, and foster leadership and participation in the IBEW. The work the EWMC has done over the years have opened doors to everyone and not just minorities and women. Changes that have been made to apprenticeship admissions allowed for easier access to all who were interested in programs. When all workers unite, all workers benefit! Nicole Grant. “Seattle’s Electrical Workers Minority Caucus: A History.” University of Washington. IBEW Local 46. “A Walk Through IBEW Local 46’s History.” IBEW Local 46.
International Brotherhood of Electrical Workers. “Who We Are.” International Brotherhood of Electrical Workers. International Brotherhood of Electrical Workers. “Henry Miller: IBEW’s Founder Kindled a Legacy.” International Brotherhood of Electrical Workers. IBEW EWMC. “Electrical Workers Minority Caucus’ Mission.” IBEW EWMC. ation (CCA), Tyree Scott was frustrated with the difficulty black contractors had in obtaining work. With the organizational and financial support of the American Friends Service Committee (AFSC), Scott formed the United Construction Workers Association (UCWA) where he could make struggles against union racism his primary focus. Scott and the UCWA used highly visible tactics to bring attention to the discrimination that was occurring in the construction workplace. The UCWA advocated for civil rights with strategies of activism, social work, and political protests. As a result of protests that were led by Scott, the U.S. Justice Department filed suit against the unions. One of these protests consisted of UCWA and their supporters, about 200 strong, and they marched down Madison Street in Seattle to the federal courthouse. On June 16, 1970, the Federal District Court ruled that the hiring practices and apprenticeship programs of Seattle’s building trade unions violated the 1964 Civil Rights Act. The presiding judge also ordered the establishment a program called the Court Order Advisory Committee (COAC) to oversee the implementation of affirmative action programs on the construction industry. Despite this ruling, a call for action by the COAC was slow moving. In the summer of 1972, Scott and UCWA members took to the streets of Seattle to protest the lack of action by the COAC. In response, the Federal District Court gave the UCWA two representative positions on the COAC. Scott was appointed as a representative on the COAC and helped to ensure that the federal court order was implemented and enforced. The actions taken by the UCWA did not solely improved the hiring practices for its own members, but benefited all workers and helped in eliminating discrimination in the workplace for everyone. Mary T. Henry. “Scott, Tyree (1940-2003).” HistoryLink.org. Casey McNerthney. “P-I Archive: Civil Rights Protests in Seattle.” Seattle P-I. Trevor Griffey. “Special Section United Construction Workers Association: History.” University of Washington. At the time, the March on Washington for Jobs and Freedom was the largest public protest calling for civil rights. In the year leading up to the March, civil rights activists voiced the need for a large national demonstration to push for federal legislation to fight discrimination, especially in the workplace and schools. Organized in three short months, people arrived at the National Mall in Washington, D.C. by cars, trains, planes, and “Freedom buses.” This powerful and peaceful protest called for fair living wages, equal employment policies, and the desegregation of schools. It was the people who came in the thousands that made the March a triumph. Many spent all the little money they had to spare to get to Washington. People organized box lunches so protesters could be fed. They sang songs and marched together for their civil rights – arm in arm, black, white, minorities, men, and women. Jessie Kindig. “March on Washington for Jobs and Freedom (August 28, 1963).” BlackPast.org. The Martin Luther King, Jr. Research and Education Institute. “March on Washington for Jobs and Freedom.” Stanford University. National Park Service. “March on Washington for Jobs and Freedom.” National Park Service. the Party was founded in Oakland, California in 1966. It has the distinction of being one of the first authorized chapters outside of California and also lasted longer than most. Originally called the Black Panther Party for Self Defense, its goal was to prevent police brutality as well as establish a new social, political, and economic order in order to protect black communities. In an effort to move away from the violent images that began to plague the BPP, Seattle leaders turned towards community service. In 1969, free breakfast programs were developed and a medical clinic was established to help marginalized members of Central Area with basic needs for survival. The medical clinic program was groundbreaking in its sickle cell anemia testing and genetic counseling program. The clinic is still in existence in the Central Area and today it is known as the Carolyn Downs Family Medical Center. These survival programs were effective in changing the BPP’s image because they not only benefited the community, but they helped to break down negative stereotypes, which gave the Party more public support. The BPP wanted equal participation for blacks in every aspect of American society. The presence of the BPP in Seattle raised the civil rights debate in the city to a new plane and raised black consciousness as well as offset white concern about the steps blacks might take to project and protect that consciousness. Peaceful actions for the community is a benefit for all. BPP members can be seen on the mural holding signs that show BPP founder and chairman Bobby Seale and the breakfast program that was established in Seattle. Knute Berger. “Seattle’s Ugly Past: Segregation in Our Neighborhoods.” Seattle Magazine. Kurt Schaefer. “The Black Panther Party in Seattle, 1968-1970.” University of Washington. Seattle Black Panther Party History and Memory Project. “Map of Headquarters and Breakfast Centers.” University of Washington. Seattle Civil Rights & Labor History Project. “Seattle Black Panther Party History and Memory Project.” University of Washington. and LGBTQ (lesbian/ gay/bisexual/ transgender/ queer) workers. tyle="font-weight: 400;">On September 8, 1965, Filipino American grape workers, members of the Agricultural Workers Organizing Committee, walked out on strike against Delano-area (California) table and wine grape growers protesting years of poor pay and conditions. The Filipinos asked Cesar Chavez, who led a mostly Latino farmworkers union, the National Farm Workers Association, to join their strike. For the first time in American history, Cesar and the United Farm Workers (the result of a merger in 1966 between the Agricultural Workers Organizing Committee and the National Farm Workers Association) decided to use a boycott in a major labor dispute. The boycott connected middle-class families in big cities with poor farm worker families in the California vineyards. Millions stopped eating grapes. At dinner tables across the country, parents gave children a simple, powerful lesson in social justice. By 1970, the grape boycott was a complete success. Table grape growers at long last signed their first union contracts, granting workers better pay, benefits, and protections. At this time, the Yakima Valley had already seen the emergence of Chicano activism. Inspired by the United Farm Workers Organizing Committee’s (UFWOC) grape boycott, two students from Yakima Valley College, Guadalupe Gamboa and Tomas Villanueva, traveled down to Delano, California in 1967 and met with UFWOC leader Cesar Chavez. Upon returning, Gamboa and Villanueva co-founded the United Farm Worker’s Co-operative (UFWC) in Toppenish, Washington. They formed the first strike organizing committee and led wildcat strikes in the hop fields of Yakima Valley in 1970. >disenfranchised Native Americans not living on reservations and no longer receiving services from the federal government. The Kinatechitapi American Indian Organization requested the city set aside the land for their use, in accordance with 1865 treaties granting surplus military land back to their original owners. Media including the Seattle Times and the Seattle Post-Intelligencer extensively covered the 3 months of the more militant Red Power movement, publicizing and helping to gain a momentum of support for the Native’s claim to the land. Eventually forty various organizations in Seattle backed of the proposed Native center. This support ultimately gave the natives the voice they needed to lobby the city and congressional representatives. They were granted a 99 year lease of 20 acres with the option for a second 99 year renewal. A master plan including an arts center, library archives, restaurant and long house was submitted for approval to the city and in 1977 the Daybreak Star Indian Cultural Center was opened. >On March 24, 1974, over 3,000 women from over 50 unions and 41 states assembled in Chicago for the founding conference of the Coalition of Labor Union Women (CLUW). At this first conference, CLUW established four basic goals: to promote affirmative action in the workplace; to strengthen the role of women in unions; to organize the unorganized women; and to increase the involvement of women in the political and legislative process. CLUW addressed the critical needs of millions of unorganized working women and made unions more responsive to the needs of all working women. CLUW sought to create a more effective voice for women in the labor movement by giving them a platform to deliver common problems and concerns and to develop action programs within the framework of their unions to deal effectively with their objectives. In 1979, the CLUW Center for Education & Research was established to provide the necessary tools for union and CLUW members to become effective advocates for working women in the workplace and the labor movement. In addition to these objectives, CLUW has spoken out for equal pay, child and elder care benefits, job security, safe workplaces, and affordable healthcare. This benefits workers of all backgrounds and capacities. Today, CLUW is a strong network that is comprised of over 40 chapters across the U.S. and Canada. CLUW is endorsed by the AFL-CIO and its international and national unions. Members in CLUW advocate for health care reform, education in women’s health, and issues of concern to working families. CLUW is much more than an organization that fights for women’s rights. They are a support network for women in unions and continue to foster leadership in communities across the nation. Coalition of Labor Union Women. “About CLUW.” Coalition of Labor Union Women. Walter P. Reuther Library. “Coalition of Labor Union Women Records.” Wayne State University. ;">The small group of 40 demonstrators who gathered in the International District (ID) on November 2, 1972 to protest the location of the Kingdome did not expect to stop the construction of the stadium. The activists on this day, who were primarily made up of young Asian Americans and students, simply wanted to express their frustrations and concerns for Seattle’s historically Asian American neighborhood. They saw urban development as a way to rid the city of its historic ethnic districts and remove the low-income housing that was much needed by the residents who lived there. Their voices were heard and they defied the stereotype of Asians being passive bystanders in a world where change was rising everywhere. The Kingdome protest sparked a sense of urgency in the community about the crumbling ID and the lack of social services being provided to its residents. Two weeks later, a larger and planned march headed toward the federal Department of Housing and Urban Development. The young and elderly commanded the need for housing funds and other human and social services in the ID for its low income and aging residents. In due time, the voices of the ID were heard. Funding was acquired and social service programs began to appear in the neighborhood. Local Asian American physicians with the assistance of University of Washington medical students established a health clinic that came to be the still operating International District Health Services. In a similar fashion, the Asian Counseling and Referral Services was started by social work professors and students from the university. The Kingdome is long gone, but the ID is still thriving in its diversity. These protests changed the way the Seattle City Council viewed all the neighborhoods in Seattle. The city created Special Review Districts that allows local business owners and residents to be involved with reviewing proposals for land and building development. Not only did the advocates of the ID create a voice for themselves, but they helped other neighborhoods to gain their own voice as well. Many voices together can create an echo that moves beyond boundaries! Seattle Civil Rights & Labor History Project. “Kingdome Protest and HUD March, Nov., 1972.” University of Washington. Mayumi Tsutakawa. “How the Kingdome Spurred the Asian-American Community’s Coming of Age.” The Seattle Times. rship, began working in Alaskan salmon canneries with his father and brothers at the age of 16. He experienced first-hand the poor conditions and disadvantages minority workers were subjected to. Silme Domingo graduated from the University of Washington with honors and was a student activist. He also founded the Seattle chapter of the Seattle chapter of the Union of Democratic Filipinos. Gene and Silme worked hard to build solidarity within their own union. They did the same with people from the Philippines and spoke out against the Marcos regime. Silme and Gene were only 29 years-young and had just began their union leadership positions the year before with the International Longshore and Warehouse Union (ILWU) Alaska Local 37. Shortly after being elected into leadership roles at the Local 37, they began working on reforming the cannery union. They were attempting to eliminate the decades of corruption, segregation, and discrimination that ran rampant in the union. Their work at reforming the union was not welcomed by all, but they never backed down to pressure. After meeting Tyree Scott, another Seattle-based labor activist and founder of the United Construction Workers Association (UCWA), Silme and Gene formed the Alaska Cannery Workers Association (ACWA) in 1973. The ACWA modeled themselves after the UCWA and fought the brutal working conditions and racist management of the cannery industry. While with the ACWA, Silme went to Alaska to see the deplorable cannery work conditions for himself and to gather information and subsequently take legal actions against the discriminatory practices of the canneries. In 1977, Silme and Gene continued their fight for reform, union democracy, and fair working conditions by forming the Rank and File Committee within Local 37. On June 1, 1981, Silme and Gene were shot inside the Seattle headquarters of the ILWU Local 37. Gene was found dead at the scene, but Silme lived long enough to identify his killers. In a twist of events that was discovered at the urging of the Silme and Gene’s family, corrupt former Local 37 President Tony Baruso and Philippine dictator Ferdinand Marcos were later implicated in the assassination. The memory of Silme and Gene live on with the workers, friends, and family who knew them. They can continue to be honored when workers stand together “to work at the service of the people.” Their memory is also honored by a scholarship fund that was founded through the efforts of the Inlandboatmen’s Union, Region 37 and the Harry Bridges Center for Labor Studies at the University of Washington. The labor activism they accomplished in their lifetime serve as an inspiration to workers and students fighting for justice worldwide. Feliks Banel. “A Seattle Murder Mystery Turned International Conspiracy.” KUOW. Harry Bridges Center for Labor Studies. “Silme Domingo & Gene Viernes Scholarship in Labor Studies.” University of Washington. Sharon Maeda. “We Can All Honor Silme Domingo and Gene Viernes By Continuing to Work at the Service of the People.” International Examiner. Bob Santos. “Memories of Gene Viernes and Silme Domingo: Good Friends and Community Activists Fighting for Reforms.” International Examiner. gton. This explosion killed six refinery workers and Equilon ultimately accepted responsibility for the tragic accident. At the time, this explosion was called the worst industrial accident since the enforcement of the Washington State Industrial Safety and Health Act (WISHA) of 1973 by the Department of Labor and Industries (L&I). Sadly, on April 2, 2010, the same Anacortes oil refinery, now owned and operated by Tesoro Corporation, was rocked by another deadly explosion and fire, This tragedy killed seven refinery workers and is now the worst industrial accident ever experienced in Washington state. L&I fined Tesoro a record breaking amount of $2.39 million for 39 counts of willful violations, which is defined as employers knowingly violating rules and and are indifferent to correcting them. $2.39 million is a very small fine when considering Tesoro generated a profit of $734 million in the 2016 fiscal year. Tesoro fought for six years to have this fine withdrawn. In a shocking turn of results, the presiding judge from the Washington Board of Industrial Insurance Appeals dismissed the fine and vacated all violations. The judge ruled the state failed to show that Tesoro was at fault for the deadly explosion. However, the fight is not over yet. As of June 2017, L&I has requested an appeal and full review of the judge’s decision. While it remains unclear if the government will be able to hold Tesoro responsible for the actions or inactions that led up to the 2010 explosion, one thing is for sure: all workers must unite to make a stand for safe work conditions because our lives depend on it. Jake Batsell and Jim Brunner. “City Shrouded in Sorrow – Victims of Anacortes Refinery Explosion Mourned.” The Seattle Times. Jack Broom and Sara Jean Green. “Five Dead in Anacores Refinery Explosion and Fire.” The Seattle Times. Daryl C. McClary. “Explosion and Fire at the Equilon Puget Sound Refinery in Anacortes Kills Six Refinery Workers on November 25, 1998.” HistoryLink.org. Daryl C. McClary. “Explosion and Fire at the Tesoro Refinery in Anacortes Kills Seven Refinery Workers on April 2, 2010.” HistoryLink.org. John Ryan. “Judge Rejects Fine for Texas Oil Company in Deadly Anacortes Blast.” KUOW. Aaron Weinberg. “L&I to Contest Judge’s Order to Vacate $2.4 Million Fine Against Tesoro.” Skagit Valley Herald. orkers, but the environment as well. On the morning of November 30, 1999, thousands of peaceful protesters locked arms and blocked World Trade Center (WTO) delegates from reaching their meeting location. They were able to successfully delay the WTO meeting and as the day grew on, so did the number of protesters. As soon as Seattle was selected to host this round of WTO meetings, activists from the city, state, nation, and globe began to organize and plan their demonstrations. Organizers from the AFL-CIO arrived in Seattle several months early to lay the protest groundwork for its labor community and affiliates. They were hoping to have 25,000 workers turn out for protests, but it was more like 40,000, according to the police’s count. Labor, union, and environmental activists began to prepare the messages they wanted to share with the WTO and the rest of the world. The planning paid off. To the global stage, protesters raised issues that included workers’ rights, sustainable economies, environmental and social issues, and civil rights. Because of these protests, many people began to learn about the WTO and large power they held in making decisions that affect the outcome of these issues. Although there was a small group of protesters who chose to use destruction and riots to spread their message of anti-WTO and anti-big corporation, the majority of the marchers demonstrated peace and solidarity. These riots spurred on over 500 protester arrests as the world watched on. Many at home watching the events unfold were inspired to join the protests. Organizations that were sometimes at odds with each other came together and marched in solidarity. “Teamsters and Turtles”, activists who dressed up as sea turtles to raise a voice for endangered species, danced together in the streets. The impact of the “Battle in Seattle” was massive. It showed the public that a people’s victory was possible. It taught the world that direct mass action can make a difference for a new generation of would be activists. Protests like the ones that took place during these five days in Seattle can still be seen today – locally and globally. We are living in a time when rights of the people seem to be reversing and it is now more important than ever to stand together in solidarity and unite! Alex Girma, Connor Guy, Eric Scigliano, and Rachel Solomon. “5 Days in Seattle that Shook the World.” Seattle Met. Kit Oldham. “WTO Meeting and Protests in Seattle (1999) – Part 1.” HistoryLink.org. Seattle Municipal Archives. “World Trade Organization Protests in Seattle.” City of Seattle. John Sellers. “Battle in Seattle.” Beautiful Trouble. p>The banners and signs held by activists on May 1st support many causes that all share the common thread of seeking human rights. Many issues are presented and they do not stand alone, but rather, these issues all intersect with each other. Marchers unite as one strong community to seek rights for all. In the last decade, Seattle’s May 1st march has shifted its focus to immigration rights. We must not remain silent as xenophobic and racist policies emerge. History, like the one that has been presented on this mural, teaches us that building the necessary powers to improve the lives of all working people only happens when we are united and strong. Instead of uprooting and deporting our coworkers, neighbors, and friends, we must stand together in solidarity and fight for policies that will promote real economic and racial justice in our country. Katherine Long, Christine Clarridge, and Nina Shapiro. “Seattle’s May Day Marches and Rallies Focus on Immigrants’ Rights, Peace.” The Seattle Times. El Comité. “Marchers Take to Streets of Seattle in Defense of Communities for 18th Annual Day March.” El Comité. As you scroll through the mural, you will notice specifc dates with titles of events. Click on the titiles to pull up additional content. Written information is split into the historical context and the artists interpretation, toggle through both with buttons located at the top of the content. Audio content is provided at the bottom of the slide in. Three years in the making, the Jackson Street Workers Mural Project began with an intention – Celebrate and hold up Seattle’s working class.